1) Whoa! How about a NSFW warning next time?! 2) HOW DID I LIVE WITHOUT THIS?!!!!?! 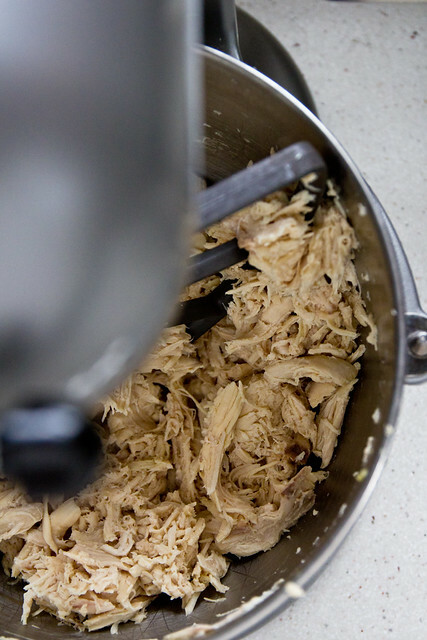 Shredding chicken with a stand mixer. And after poking around on Pinterest, I see that someone has even used a regular hand mixer. 4 years ago. And if someone doesn’t tell me that this is new to them, you can mark me down as officially the last person to know. Maybe there’s no benefit in getting the mixer bowl dirty when you’re looking at shredding 1-2 chicken breasts. But when the mixer bowl is already out because you made a quadruple batch of pizza dough for the freezer? You can throw the the breasts and tenders from 6 split breasts into the mixer and in ~25 seconds on low speed, you have perfectly shredded chicken. So you can spend a rainy afternoon rolling 5 million 4 million flautas for the freezer. You’d have to mark us as the last two people – I never even thought to try this and I use my kitchen aid for a pretty diverse task list. I wonder how this would work for pulled pork? I might have to try it! Nope. I didn’t know about this, either. I feel a double batch of chicken enchiladas coming on. I found this on Pinterest too. Makes chicken enchilada night so much easier! I didn’t know I could use a hand mixer too! Now I must try! How did I not know this?!!! And it really was posted in 2008! Geez, where have I been all this time? Oh my GAH! Why did I not know this sooner! I hate shredding chicken more than almost any kitchen task, so Ben usually ends up doing it. We both thank you. Seriously? No, you are not the last to know! Can’t wait to try this! This idea is brilliant; I’d never heard of it either! Thank you for sharing!! I absolutely LOVE this idea and have never seen this before so you are certainly not the last to know! I cannot stand shredding checking…if it is in a recipe it goes into the “maybe one day” category but certainly isn’t doing itself any favors so I am thrilled to know that is no longer a deal breaker for me with so many delicious recipes! Somebody may have already mentioned this – but it’s also great for shredded pork or beef – in particular I love to do it to make Pulled BBQ Pork for Pork sandwiches! Cook a big roast in the crock pot all day, then pop it in the mixer for a couple of minutes, pour on the BBQ and it’s done!! too on hard boiled eggs for egg salad and avocado for guac. I found this a few months ago and it changed my life!! haha! I didn’t know about that.. Useful piece of information it is! I have been doing this for a few months now, I will never go back. I use it for pulled pork too, works like a charm! My. Life. Is. Complete. Thank you!! I never knew about this either. My husband HATES doing this and will avoid it at any cost! This is going to be world-changing in our-toddler-won’t-wait-that-long-for-dinner world! I tried this last night and it worked well. Thank you for the sugestion!! So glad you found this tip as useful as I did! It’s seriously amazing! I’m with you, I had no idea we could do this. This is genius, I absolutely loathe shredding chicken! Nice tip! I use my stand mixer to mix ingredietnts for meatloaf. Works like a charm too! After shredding the first of 7 chicken breasts for a party tonight, a lightbulb went off and I remembered this awesome tip you shared! You have no idea how much time (and potential arthritis) you just saved me! Wow! I shredded 2lbs of cooked chicken breasts tonight. Incredible! It worked incredibly well!! Great tip for me! I love making lots of meals at once and this will make the job so much easier. Thanks.